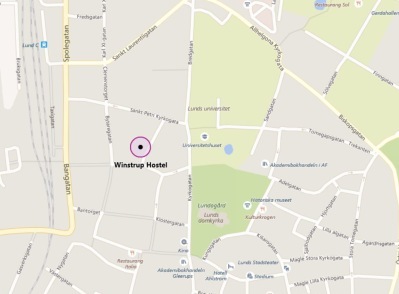 It is only a few minutes walk from Winstrup Hostel to the train station, Lund University and the impressive Cathedral. Most of the city’s parks, interesting sights, meeting places, sports arenas are within walking distance. We have 38 sleeping pods divided across six rooms, additional beds may be added when required. Our common kitchen is large and well equipped with induction stove, hot air and microwave ovens, dishwashers and two large refrigerators. Adjacent to our kitchen you will find our lounge area which seats 28 people and an additional comfortable sofa. Stream movies to our large screen using Chromecst, HDMI or directly from the web. Our offer includes bedlinen and fast WiFi. Price for groups depends on the number of guests and length of stay. Send us an inquiry and we will revert with an offer. We offer a basic breakfast buffe to groups for SEK 50 per person. Lunch and dinner may be served as well, contact us to discuss your options. We can arrange for single and double rooms for coaches, accompanying parents or other adults travelling with the group at our collaboration partners Hotell Oskar and CheckInn B&B. Parking for hire is available at the back of the hostel.